SSM allows users to configure all servers, cameras, recorders on the system through one UI and setup user/group policies for the whole systems. Module-based system architecture, SSM can fit on any size system utilising various combinations of modules to meet any end-user needs and system requirements. In addition to small business site, SSM provides a suitable solution for enterprise site with numerous features for high-end market such as federation, failover, 3rd party integration and more. Reliability is the key of surveillance systems, SSM will keep your system alive at any time through 1 to N fail-over system, Auto Recovery Back-up (ARB) and dashboard to overview the whole system at a glance. With Transaction server, 3rd party systems like access control and intrusion detection can easily be integrated with SSM as one solution. Through the event viewer, every critical event can be monitored and actioned allowing the operator to response faster. By utilising the 9 types of search methods, the operators can find the evidence quickly and easily to minimize the investigation time. Conventional monitoring solutions have an on-site administrator to control the local devices; this can limit the scope when expanding the monitoring system. SSM supports multi-site/multi-client monitoring that removes this limitation making it suited for mid to large sized monitoring applications. Wisenet network connected products are registered and managed by SSM server. The server can search the connected equipment, support health checks and upgrade each device to ensure that they are maintained in the best condition. Individual sites, users and user group management is controlled by the system manager. With this level of authorisation access and management, certain sites or devices and management function can be controlled at the user level. SSM Virtual Matrix is designed to control wall-monitors and ensures the operator maintains complete control of all monitors, allowing immediate video view control and switching event video to resolve incidents fast. - Provide sequence, event and map monitoring mode for more efficient monitoring. - Multi monitors can be merged as one monitor without any additional devices. In mobile environment, recorded video with high resolution and frame-rate cannot be played because of bandwidth limitation. Transcoder trancodes the recorded video to a lower bandwidth stream for more reliable monitoring. SSM's Federation feature makes it possible to connect geographically distributed, independent SSM systems to mimic a larger system. All systems are managed independently, easing the problem of managing a single, centralised system, yet providing the benefits of centralised systems. Connecting two SSM systems takes less than a minute and users will be able to access the remote system's live and recorded video as if it is a local system. Transaction Server is an interface between SSM and a third-party system such as access control or intrusion alarm system. It makes SSM an Enterprise system that generally needs system integration with those systems. 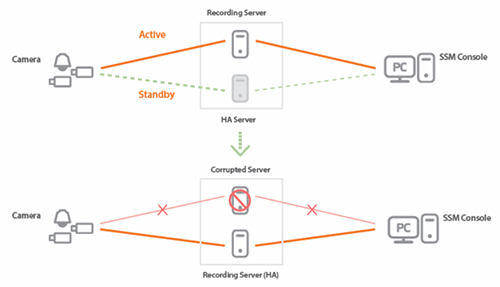 For the sustainable system operation, HA server acts like a watchdog for SSM servers and if a server is corrupted by the network or system itself, HA takes over the role of the system. After recovering the corrupted system, HA will automatically hand over vice versa. - HA is ready for Recording Server, Media Gateway and Virtual Matrix. - For cost reduction, a single HA can watch multi servers because all servers are seldom corrupted simultaneously. 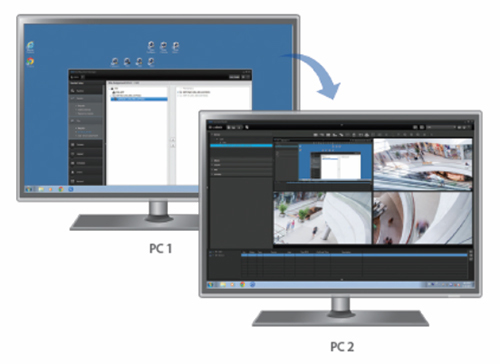 The screen of a PC with Screen Mirroring can be displayed on a console or video wall with Virtual Matrix Server and can be recorded in Recording server. This is used for making video evidence of third party software like building management software, energy system, PoS system and so on. For rapid video evidence search, Video Summary provides several minute-long video clips for several hour-long video data. It shows only moving objects at extremely reduced time. In case of network failure, video data from a camera cannot be streamed to Recording Server so important evidence may be missed. 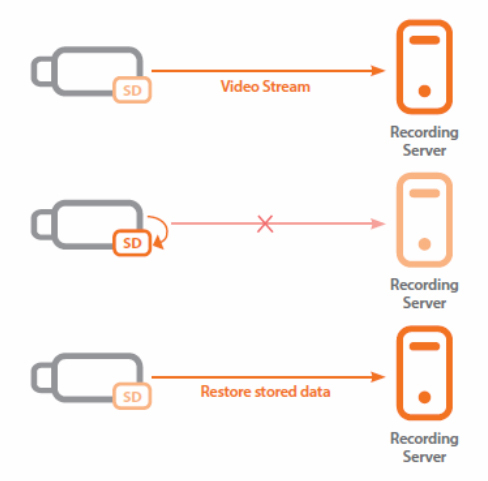 However Auto Recovery Backup feature enables the camera to store video data to the SD Card on the camera and when the network comes back online the camera sends the stored data to the Recording Server for recording reliability. Companies usually use their own user authority policy so additional user set-up for SSM could be a time consuming job. SSM supports LDAP so that it can utilise company's pre-defined user authority system such as MS Active Directory. For efficient and reliable monitoring, SSM provides automatic profile change feature in which a high profile video stream is displayed on a big picture screen format such as 1x1, 2x2 and low profile is displayed no a small picture screen format automatically. This is very effective because high profile video quality is not needed on a small screen. For screen format like 6x6 or 8x8,'I-frame only' can be a more comprehensive option because of PC performance limitations. All event related features such as event priority, event colouring, rule-based event action set-up, real-time event thumbnail display allow for efficient monitoring, which means more surveillance coverage is possible with lower budgets. Furthermore, SSM provides a separated event viewer that provides real-time event log with a single channel preview. - Each event could be acknowledged by operator with some notes. - Audio broadcasting for warming people in a dangerous event situation. With SSM, an administrator can set a map-based layout to match with love videos in real-time. Overlaying camera or sensor icons means the resolving of issues becomes extremely easy. By utilising map based monitoring with live monitoring, an event pop-up window will appear on the location where the event has happened helping towards a quick resolution to the event. As we;; as 2D ,map image, Google Maps can be used for wide area surveillance. SSM provides 9 types of search modes for quick evidence retrieval. - Data/time, event, bookmark, and local folder search are the basic search features. - POS, heat-map business intelligence features for retail shop owners. - Motion search and smart search makes it possible to retrieve evidence within a very short period of time. - Video Summary is one of the key features of SSM that provides 1 minute video clips for every 24 hours. All system devices that include servers, cameras and recorders can be monitored with a single dashboard. It shows detailed system information such as device and component status, CPU performance, memory usage, network bandwidth and HDD consumption. It also gives event statistics for efficient event management. For mobile accessibility such as tablet PC and smartphone, Dashboard provides plug-in free web access feature for any browsers such as Google Chrome, Safari, Firefox and Edge. Easily access SSM with the SSM mobile app with intuitive user interface. SSM mobile app allows the user to monitor live video and playback recorded video. If mobile bandwidth is not enough, SSM transcoder can provide a stable streaming environment.